True or False: it’s possible to be critical and engaged in issues surrounding Muslim women’s representation without tearing down Muslim women. While this should be an obvious truth, the experience of an increasing number of Muslim women in the public eye reveals a contrary sentiment within the Muslim community-at-large. Especially for those visible Muslim women carrying what the West perceives as today’s symbol of Islam on their heads in the headscarf, the stakes of tokenization, racism, and sexism are that much higher. In the age of social media and diverse media representation, we are witnessing the rise of a new figure that many of us never imagined we would see in our lifetimes: The Public Hijabi. The Public Hijabi is the emerging profile of a Muslim woman, usually identifiable by her hijab, in the mainstream landscape, often tokenized to represent Islam or Muslim women. Long neglected from mainstream inclusion except through largely negative portrayals, the Public Hijabi marks a new age in the role we play and level of visibility we receive in society, and it’s one that comes with newfound potential, rewards, risks and challenges. The fact of the matter is that we are witnessing the rise of an image of a Muslim woman that is being tokenized and also stigmatized because our presence in the public eye is uncomfortable for both non-Muslims and the Muslim community alike. 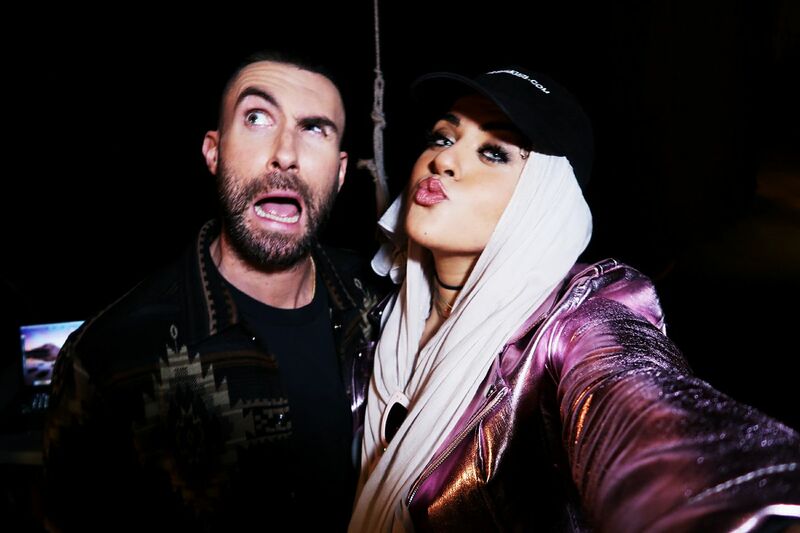 As a Public Hijabi, some of these conversations started rising to the surface after I appeared in Maroon 5’s “Girls Like You” video. While the overwhelming response celebrated the unprecedented milestone, there were some people who were angry that I took part in a project that also included Gal Gadot, an outspoken proponent of military occupation, especially after the global impact of my turning down an award earlier in the year because of her political statements. The visceral reaction was quick to dismiss me as a “fame whore” and left behind any space for nuance. People did not care to acknowledge that the award I rejected was in celebration of Gal’s new makeup campaign. I would have been the only individual to receive it on her platform, which indeed would have normalized my participation as a Public Hijabi, especially as a minority woman negatively impacted by her vocal stances. The “Girls Like You” video was Maroon 5’s project. Gal and I both received the same invitation to take part in it along with dozens of the most visible female public figures in the United States. Maroon 5 equally offered their powerful platform to activists representing some of today’s biggest issues, such as immigration, indigenous rights, sexual assault, and more. Though she was not headlining or even a central subject in it, individuals angry with Gal’s inclusion in such a highly visible project felt that it was influential in normalizing her pro-occupation stance. Ironically, this was the first time that an outspoken Palestinian Muslim woman ascended to the same level of mainstream visibility as Wonder Woman, but critics did not see it that way. Instead, the onus was placed on the Public Hijabi — a member of an already marginalized group — to surrender an opportunity that symbolized a far greater breakthrough for our cause. In the current media and political landscape, it’s been my experience that the Public Hijabi has not only become a lightning rod for globalized vitriolic attitudes towards Muslims, but also often for the frustrations, sexist attitudes, and collective blame of the Muslim community itself — yes, often perpetuated by Muslim women, too. We paint all Public Hijabis — not just influencers, but also activists, community leaders, fashion designers, tastemakers, and more — with one broad stroke and, in large part due to sexism, dismiss them by sheer virtue of their presence in the public space, or, worse, blame them for the oppression they experience navigating these spaces. Muslim women are one of the most recognizable, misunderstood, and targeted religious minorities in today’s political climate. While hate crimes against Muslims across the board skyrocketed after the November 2016 election, they were disproportionately committed against veiled Muslim women. Anti-Muslim sentiment has always been bolstered by historically restricting the portrayal of Muslim women to a one-dimensional caricature of face veils, black fabric, and voiceless oppression. This is why the Public Hijabi is worth the present risk of what we must ensure is only a temporary moment of tokenization on our journey to breaking the doors wide open for countless more Muslim voices to populate these spaces. The War on Terror and post-9/11 era have demonstrated to us first-hand the irreparable damage of media misrepresentation on both an individual and political level. Not seeing a reflection of ourselves in the world around us is one of the surest ways we are denied our humanity. Cultivating a presence for ourselves in the public space is necessary if we want our voices to become impossible to ignore any longer. For myself and countless girls and young women today, the Public Hijabi is our proclamation that we are here. As we pilot the frontlines, it’s necessary for our community to constantly reassess and renegotiate how we engage with this new form of representation. Discourse around which Muslim women receive visibility and on what terms, and, ultimately, the dismantling of the token concept of the Public Hijabi, is absolutely vital and deserves far more ink. It’s no secret that the Public Hijabi has a singular globalized appearance: she is usually young, conventionally attractive, and fashion forward. The mainstream space has made it so eligibility to enter is defined by the Public Hijabi playing into the beauty industrial complex, perpetuating impossible and often eurocentric beauty standards for Muslim women. It’s hard to deny that in many ways, the Public Hijabi is a manifestation of the Western gaze’s internalization of how Muslim women should look, most of all defined by wearing a headscarf as the foremost qualifier. It’s my hope is that this brief writing serves as a stepping stone for further analysis. The Public Hijabi should never be viewed as the end goal or the epitome of representation realized, but rather as a vehicle at this moment in our struggle to gain access and inclusion in spaces from which we’ve historically been neglected in order to make space for more marginalized voices. Along our representational evolution, much like other racialized minorities before us, it’s true that the Public Hijabi has been commodified and normalized, but this is not the case in every situation and not every situation should be dismissed as such. This is why nuance is imperative if we are to keep progressing our representation forward. It’s impossible to deny that visible Muslim women have a far more difficult experience in the public eye than their male counterparts. For the sake of our collective social health and political well-being, it’s imperative for us to call out this phenomenon not only as a moral and religious obligation but also in order to nurture Muslim women’s leadership. It’s clear that a pattern has emerged that has long preceded our current media developments but upon which the Public Hijabi has brought to the surface in our social media age. First, it’s no secret that many Muslims collectively uphold veiled Muslim women to the highest religious standard. We take a spiritual practice between her and her Creator and cast it into the court of public opinion, turning it into a qualifier for a game of all or nothing. Shaming women for the sacrifice they already make to commit to hijab in non-Muslim countries is widely viewed in our community to not only be acceptable, but also religiously justified. Islamic concepts such as “naseeha,” or counsel, or the repeated hadith of “changing evil with one’s tongue,” are misapplied to publicly police Muslim women. For the Public Hijabi, the most common way this emerges is through calling out her religious practice on social media platforms or in her comments sections, often in an insulting or antagonizing way. This is symptomatic of the exertion of control over Muslim women’s bodies, especially in the public space. Second, hijab-shaming and policing becomes compounded when it’s a Public Hijabi. For Muslim women who place themselves in the public eye, all bets are off. The community immediately feels entitled to monitor, police, judge, and even shame any and every action she makes, private or public, as if they are the Judge Himself. She becomes a de facto role model and her personal practice of Islam is involuntarily upheld to being the perfect Muslim example, on the public’s terms, as socially obligated by her visibility or large following as a Muslim woman. Moral absolutism is applied heavy-handedly and she is either a Good Muslim Woman or a Bad Muslim Woman, or even Not Really A Muslim At All. This is not to say that the Public Hijabi shouldn’t be held accountable for public actions; quite the contrary. Because we are inevitably being tokenized at this moment in time, it’s our moral responsibility to be cognizant of the way we are representing our communities. This takes me back to my opening statement that we can be engaged on the issues without tearing down women. Such necessary discourse should not include judgment of the Public Hijabi’s personal faith and religiosity, as determined by the public, extending to her intentions and thus defining her work. Such grievances are rarely made of male figures ascending to new heights of success, but only ever placed on the success achieved by our sisters. Third, the exertion of control over Muslim women’s bodies is expressed through cultural notions like the emphasis placed on Muslim women’s chastity, sexuality, and purity. There’s a reason why my post about a singer I admire giving me a peck on the cheek received far more attention than any post highlighting our work or wins for Muslim women, and why some felt this transgression far outweighs any and all past and present work. Even though I never touted my actions as justified by Islamic jurisprudence, many exerted immeasurable amounts of energy undermining my faith — regardless of who was throwing stones in a glass house — and thus my Muslim leadership. Similarly, when we announced that Muslim Girl became the first Muslim company to land on the Forbes 30 Under 30 list, a flurry of comments ignored the groundbreaking achievement and instead questioned why my forearms were showing in the announcement photo. The fact that more outrage is often directed at what we do with our bodies rather than the systemic global obstacles facing Muslim women that our work fights against is exactly the issue. Finally, that all leads to this: the public pressure mounts into blaming and shaming Public Hijabis for the adversity we experience in industries that were never meant for us in the first place. Rather than critics expressing their feedback to Maroon 5 about why Gal’s inclusion was alienating to those fighting for human rights, which would have been more effective to their cause, many directed vitriol and blame onto me for taking up space in the video. This is similar to when the CEO of ORLY, the company with which we launched the first brand deal for Muslim women with halal-certified nail polishes, was exposed for making racist social media posts. Many blamed, attacked, and ostracized our young minority and women-led team rather than hold the partner company accountable for the transgression. What we are doing here is cultivating an environment that destroys the Muslim women who dare enter it. Because we have been denied representation for so long, it’s easy to tokenize or criticize the Public Hijabi. All points considered, it’s impossible to ignore that the emergence of the Public Hijabi is an important development in our community-wide struggle to not only be seen, but heard. Her treatment is a litmus test for our social standing in the current political climate just as much as our spiritual condition as a Muslim community. We’re in a moment right now that demands our moral obligation to uphold responsible representation in all its forms. Let’s just make sure we direct our furor towards dismantling the system that created the need for the Public Hijabi in the first place.